The Hotel Medici is perfect for those on a low budget, looking for a clean and friendly hotel right in the heart of Florence and in walking distance to all the main sights. Florence is best explored on foot which means this 2 star hotel in Florence's historical centre will not only save you money but also time due to its central location so you can wander the cobbled streets, taking in the magnificent Renaissance buildings, magical piazzas and visit the world famous museums. The name is taken from the powerful Medici family who ruled Florence over four centuries and who were responsible for much of Florence's wealth and influence. 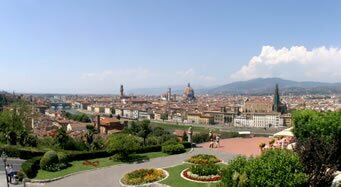 So if you are a traveller on a budget looking for comfortable and relaxing low cost accommodation with the energy and excitement of Florence's sights, restaurants and bars on the doorstep then don't look any further. Use our secure online booking system to confirm a memorable stay at the Hotel Medici. The Hotel Medici Florence is set in a charming old Florentine building offering a spectacular roof terrace where one can relax at the end of a long day with a glass of wine and soak in the breathtaking panoramic views of the Duomo, Giotto's Bell Tower, the impressive Palazzo Vecchio in Piazza della Signoría and picturesque rooftops. Take a look at our photo gallery or take our virtual tour for a sneak preview. Get the most out of your stay by using the Medici Hotel's concierge and tourist information service as well as museum reservation service which will save you lots of time at any time of year but especially in high season.